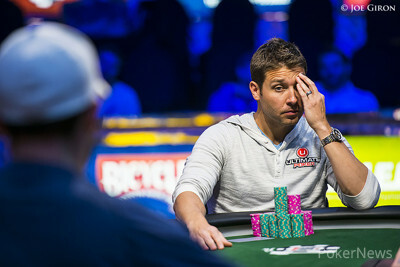 When Joe Cada won the 2009 World Series of Poker Main Event, he was the target of criticism. The young kid from Detroit was dragged through the mud for "running like god" on the biggest stage in poker, but in the last decade, few Main Event champions have put up WSOP results at the Rio like Cada has. 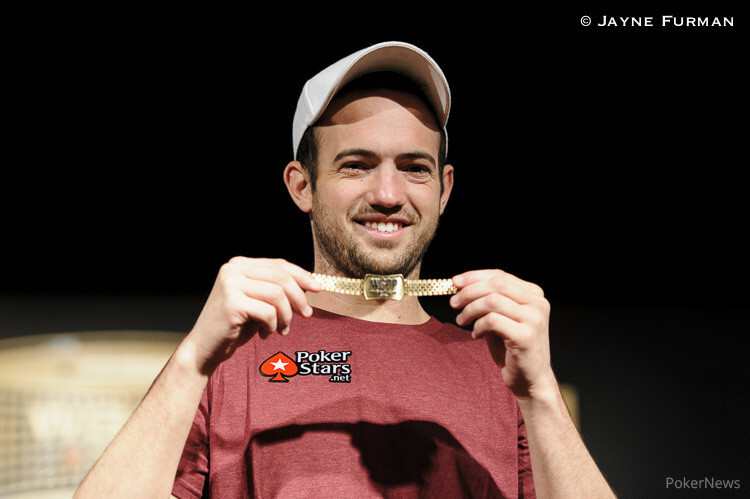 The ’09 champ fell just short of winning his second bracelet in 2012, finishing runner-up to Carter Phillips, and he finished in fourth place twice in 2013. 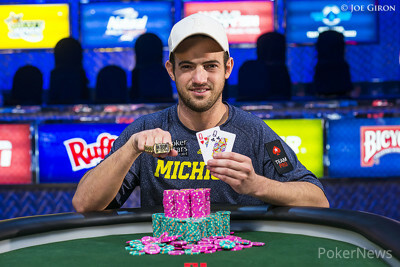 Cada couldn’t be held back any longer, and on Monday he topped a very impressive final table to win Event #32: $10,000 Six-Handed No-Limit Hold’em Championship, his second gold bracelet, and $670,041. Since Carlos Mortensen, Cada becomes the most recent Main Event champion to win a bracelet after winning the biggest tournament in poker. Joe Hachem is the only other champion to get to heads-up play — the Aussie lost to Dutch Boyd in a $2,500 six-handed event in 2006. Cada is the 10th previous bracelet winner to win at the 2014 WSOP, and he defeated a fellow bracelet winner heads up; Jeremy Ausmus. Ausmus, who won a pot-limit Omaha event at the 2013 World Series of Poker Europe, earned $414,104 for his second-place finish. Ausmus and Cada flipped for 93% of the chips in play on Hand #107, and Cada’s pocket eights held against Ausmus’ ace-jack suited. Ausmus was able to find a small double up not too long after, but on the final hand he ran pocket jacks into Cada’s pocket queens. Max Silver, JC Tran, Erick Lindgren, and Dario Sammartino also reached this stacked, and very swingy final table. Silver and Sammartino were the only non-bracelet winners, and they exited in third and sixth places, respectively. Silver, who entered the day as the chip leader, tried a hero call with second pair against Cada’s top pair during four-handed play, then moved all in out of the small blind with ten-high. Cada called with an ace, and held. In a bit of foreshadowing, Sammartino exited with jacks against the pocket queens of Ausmus. Lindgren, who won the $5,000 buy-in variant of this event in 2013, took the chip lead with two tables remaining, but couldn’t get anything going at the final table. Like Silver, he jammed in a blind-versus-blind scenario with ten-high, and it was Silver who called with king-high. The Brit's hand held up, and Lindgren left the stage. Tran floated with an average-to-below-average stack throughout Day 3, and busted in fourth place in a flip with ace-queen against Ausmus’ pocket jacks. The day began with 13 players, and the players who fell before the final table were Layne Flack, Lee Markholt, Scott Clements, Hiren “Sunny” Patel, George Danzer, Kyle White, and Martin Jacobson. Patel five-bet shoved with ace-jack and was called by Ausmus, who turned over ace-king. There was a jack in the window of the flop, but it was followed by a king, and Patel failed to improve on the turn or the river. 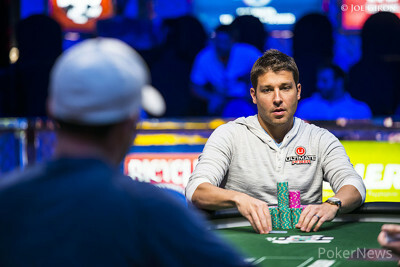 Jacobson reached the feature stage, making the unofficial final table of seven, but he was unable to run up his short stack before being busted by Sammartino holding a weak ace against the Italian’s pocket tens. That does it for our coverage of Event #32: $10,000 Six-Handed No-Limit Hold’em Championship. PokerNews will be on hand to cover all of the events here at the 45th Annual World Series of Poker, so be sure to keep your browser right here. Until then, good night from Las Vegas! Hand #112: Jeremy Ausmus min-raised to 120,000 on the button, Joe Cada three-bet to 300,000, and Ausmus moved all in. Cada snap-called. Ausmus was dominated, but the flop gave him a backdoor flush draw. The on the turn left Ausmus with only two outs to survive, and it wasn't to be as the bricked off on the river. 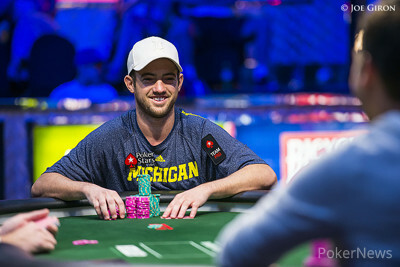 Ausmus, who has appeared at WSOP final tables in Las Vegas, New Orleans, Australia, and Europe, was eliminated in second place, earning $414,104. Hand #108: Jeremy Ausmus moved all in and Joe Cada folded. Hand #109: Ausmus received a walk in the big blind. Hand #110: Ausmus moved all in and Cada folded. Hand #111: Cada raised and Ausmus moved all in for 715,000. The board ran out and Ausmus doubled up. Hand #107: Joe Cada raised to 125,000 on the button, Jeremy Ausmus three-bet to 375,000, and Cada four-bet to 950,000. Ausmus moved all in for effectively 3.685 million, and Cada quickly called. The two were racing for 93% of the chips in play, and the 2009 WSOP Main Event champ remained ahead on a flop of . The turn was the , the ultimate sweat card, and the Mothership burst into a chorus of "ooooh's" and "aaaaah's." Ausmus could lock up his second bracelet with an ace, jack, king, or diamond on the river, but it was not to be as the completed the board. Cada doubled to 7.38 million chips, while Ausmus only has 550,000. Hand #102: Jeremy Ausmus raised to 125,000 and Joe Cada called. The flop brought out and Cada check-called 125,000. On the turn the hit and both players checked. The river was the and both players checked. The pot was chopped. Hand #103: Cada raised to 125,000 and Ausmus folded. Hand #104: Ausmus called from the button and Cada checked. The flop brought out and Ausmus bet 60,000, Cada called. On the turn the hit and both players checked. The river was the Cada bet 100,000, which got Ausmus to fold his hand. Hand #105: Cada raised to 125,000 and Ausmus called. The flop was and both players checked. The turn was the and both players checked. The river was the and again the action was checked. Cada showed and he raked in this pot. Hand #106: The flop brought and Cada check-called 130,000. On the turn the popped up and Ausmus bet 275,000 after Cada had checked again. Cada called again and the river was the . Cada checked and both players checked. Cada showed and that was enough to take down the pot. Hand #96: Jeremy Ausmus raised to 125,000 on the button, and Joe Cada folded. Hand #97: Ausmus received a walk. Hand #98: Ausmus raised to 125,000, Cada three-bet to 400,000, and Ausmus folded. Hand #99: Cada raised to 110,000 on the button, and Ausmus folded. Hand #100: Ausmus raised to 125,000, Cada called, and the dealer fanned . Both players checked. The turn was the , Cada led out for 125,000, and Ausmus called. The completed the board, Cada checked, and Ausmus checked behind. Cada showed , but it was no good against Ausmus' . Hand #101: Cada raised to 110,000, winning the blinds and antes.